Reach us at contactus@thegrint.com - We do respond! 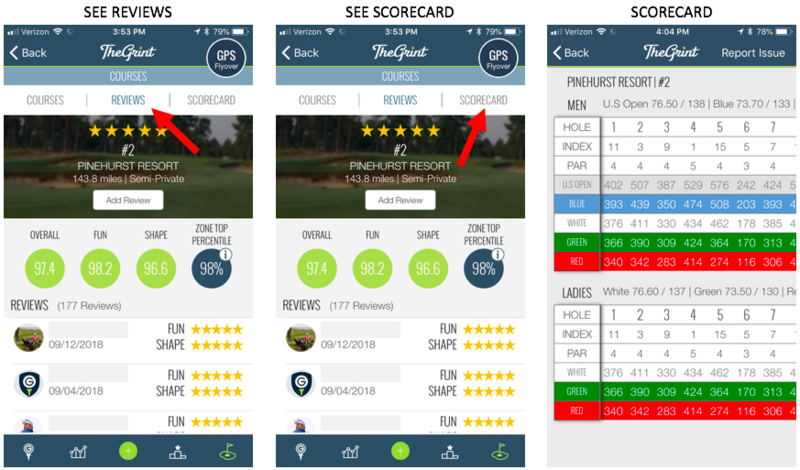 We are excited to announce a brand new section of our app that we believe will add a lot of color to how you track your golf experience. A big part of your golf experience is defined by the courses you play, and keeping track of that is something we want to help you with. 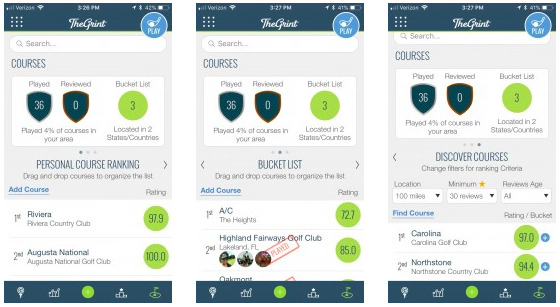 With the NEW My Courses section you will be able to 1) Keep track of the courses you have played, 2) Rank them based on your preferences, 3) Create a bucket list and 4) Discover new courses that you may want to play. 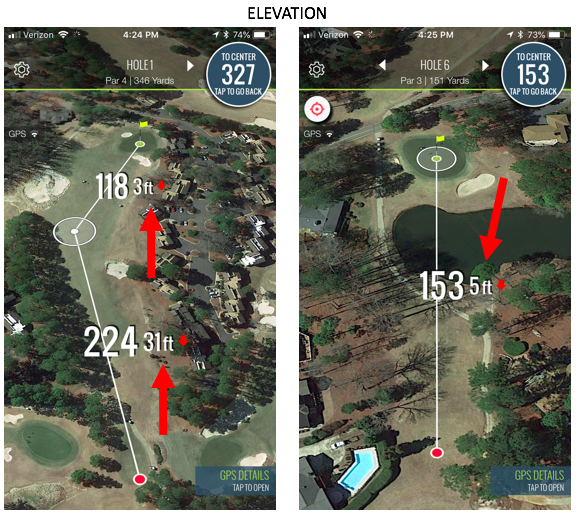 Additionally, we added the GPS Flyover feature, which will allow you to checkout the layout of a Course without having to open the Score Tracker. We truly believe this will enhance your TheGrint experience! Thanks to all of you who gave us your suggestions and to all PRO Members as their contributions make releasing new features possible. Remember: 100% of our PRO Membership Sales go back into the development of new features. To open the My Courses section press the rightmost button in the bottom menu of your home screen. In there you will first find a list of the courses you have played ranked by rating. To rank them, simply drag and drop each golf course on the list. If you swipe left then you will find your new Bucket List. At first its an empty list, and all you need to do is Search and Add courses to it. Its quite easy. If you swipe left once more, you will reach the Discover List. Initially it will be displaying all courses near you (100 miles radius). The list will show first the best ranked courses based on the Reviews of the Grinter Community. You can also play with the filters to Discover other courses. Finally, you can Search any course you want using the Search Bar on the top. Also, one of the coolest things you can do now in this section is explore the Course GPS before you go play the Course! 1) Search for the Course you want to check out. 2) Tap on the Top Right where it says “GPS Flyover”. 3) You can move from Hole to Hole using the Top Arrows on the Top of the GPS. 4) To go back to the Course Feature just tap on the Top Right Circle where the Yardages are shown. And you can also check the Scorecard so you know exactly what you are facing later on when you go play some Golf. Another cool thing some of you Grinters have requested is Live! This a very important Feature for Golfers all over the World, as Elevation is a big factor when choosing the Right Club for every Shot. All of the Features we have Added throughout the Years have been thanks to you Grinters! And know that 100% of all Pro Memberships go towards New Developments and Improvements, so thank you to all Pro Members who have helped make TheGrint what it is today! How is my TheGrint Golf Handicap Calculated? How Is My Golf Handicap Calculated? How to calculate a Golf Handicap? TheGrint – Golf Games Feature on Androids! Golfers Handicap Distribution – What is the Average Golf Handicap? 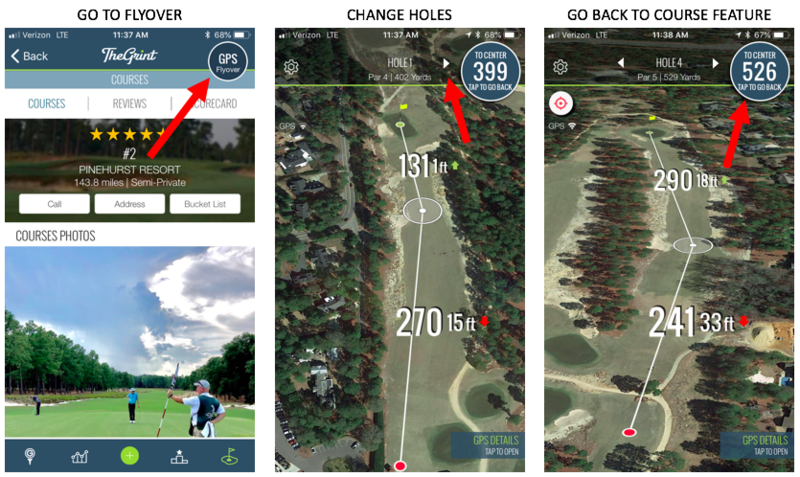 What would the golf game look like without the Golf Handicap App? TheGrint - Since 2011. | All Right Reserved.